Round stones and shapes, like marbles and freeform crystals, are among the hardest items to wrap in wire–which is why Dale “Cougar” Armstrong is teaching them! This video will prepare you for professional wire wrapping in this class to make a pendant, complete with a finished bail, from your item! Do you collect rocks, seashells, sea glass, and other natural treasures? Or perhaps you’ve found some marbles, tiny figurines, or other trinkets you’d love to incorporate in a jewelry design, and they’d be much more appreciated in jewelry than tucked away in a drawer or hutch. 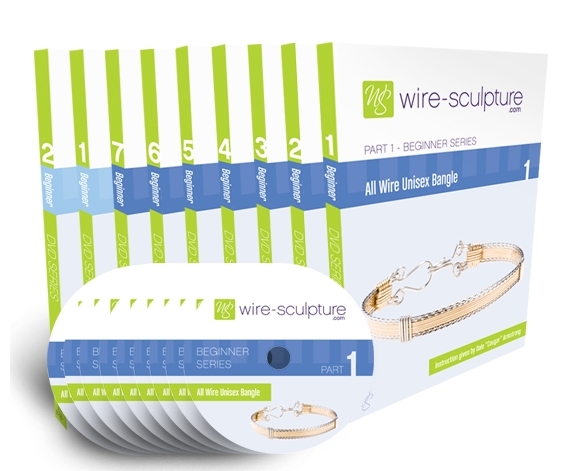 This is the class that will turn these trinkets into treasured jewelry to wear every day! This is a perfect project for sea glass, sea pottery, freeform rocks, and other nontraditional jewelry items. 10 Responses to Lesson 3 – Lock That Rock! After reviewing this video twice, I started making a piece with you. It was easy to understand, I like the “pause” feature and my very first piece came out as I had hoped. I then went back and took lesson 4. I realize now I should have just purchased all the lessons as I surely will now. You’re a great teacher. Thanks! Thanks for yet another AWESOME lesson! I got so caught up in doing what you were w/o looking up that I cut my wrapping wire after the 1st 3 wraps around the ‘cage’! LoL I added the extra wraps with a new piece of wire though and although it doesn’t look as good as it should have; I’m proud of the piece as a first of this type. I want to send you a picture of it Dale, but can’t find the location you spoke of so I will email it to you. I can’t wait to do this on other items! Is the other type design like it you spoke of being on the video a lot better or versatile? I’d love to learn it. Maybe now that I’ve learned all you’ve taught so far; I will be able to make enough off some pieces to be able to afford that video! Pray it works out so I can learn another technique!!!! Thanks again for your teaching style that makes it possible for a person like myself who normally only learns well in a face to face classroom. You are awesome! Hi Wendy, thanks so much for sending me the photos of your lovely ‘Marble Treasure’ – nice work! The other pattern is where the wire lies on the stone or crystal as you ‘weave’ or ‘cage’ it around the item. 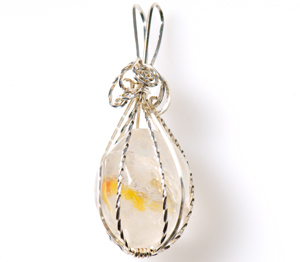 Check out the photo (scroll down to the Caged Crystal Pendant) and see if you can make it from the photo, combined with your Lock That Rock skills : ) Have a lovely Mother’s Day weekend! Okay this one was definitely tricky with what rock I choose. Overall love the result and would expect this to be a winner for those who do have some loose stones that they don’t know what to do with. Dale, I have used this design to wrap several pieces of extremely fragile mineral formations from a fishing location that a number of my friends, and I, share memories. ” Lock that rock” successfully caged an otherwise impossible treasure I will gift to my friends this upcoming Holiday season… once again you have saved the day and brought sunlight into my life! Loved, loved, loved this class! I know I will use this patterns’ basics again and again. I especially love the way bronze responds to the curves of this classic design. Bravo Dale you have once again made jewelry making the greatest experience of my life! Looks very good, and had lots of helpful tips. I’ve been trying to do this and have had minimal success. This lesson really is helpful.